the street. We’re not going to make it. She uses the simple details of life in various places to weave together narrative and emotional sentences that are conservative in tone, but open and heartfelt too. She writes that “we were never / going to make it. The darkness creeps / over, smears in the rain.” She writes about cities and drinking, Morrissey and Nick Drake, all a soundtrack that lets her live a life of deep feeling. Part of this book wants what’s permanent, wants to make memory from sorrow. Yet part of this book knows that the world is about moving on from the past. In “Twenty-Seven: An Inventory,” she writes about the events of her life, and counts them, too. One of the most telling lines, “3 months of stoicism lost / in a single night’s collapse” is part of this poem. The last two poems titled “Hold It Down” are found at the end of the book, and in the first, Myers writes: “All over the country / people are moving into the streets / & we’re here in Atlanta starting a new life.” She writes about a new place, being there with someone, and getting used to the dailiness of her new life. And in the last poem, “Hold It Down” also, for N & K, Myers ends her book on a note of loveliness and beauty: “Blessed / is this day.” The book ends with words of wisdom: “Not every day / can be a good day / but this is one / of them, one / of the best days.” The reader leaves with the sense that there are moments of love and happiness within even the saddest of times, and that is a good thought with which to end. 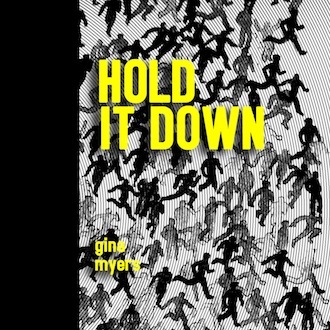 Hold It Down is available through Coconut Books.